18. 陳錦杏,蘇文凱,”導入客製化人力資源資訊系統與員工績效評估之關聯性研究”, International Journal of Advanced Information Technologies (IJAIT), 第六卷第二期, Dec. 2012. 22. Yuan-Jen Chang, Li-Feng Lin, Chin-Hsing Chen, Wen-Tzeng Huang, “An Integrated Service Model for Community Care: Designing a Healthy Life for the Elderly in Taiwan,” Public Health Frontier, Vol. 1 No. 2, pp.1-12, June, 2012. 24. 陳錦杏,蔡玲真,金榮義,呂彥陞, “應用迴歸樹於急診室衛材存量之預測", 健康管理學刊, 第九卷, 第二期, pp218-235, Dec., 2011. 46. 黃文增, 鄭重志, 陳俊達, 陳錦杏, (2008) . 多層式儲存格反及閘快閃記憶體之管理. 台北科技大學學報, Vol. 41-1, pp. 101-113 (ISSN: 1029-3981) 5983, 97.03. 47. 黃文增, 周慶棟, 古士興, 陳錦杏, (2008) . 具有抑制同步切換雜訊的加強型IBIS 模型設計. 台北科技大學學報, Vol. 41-1, pp. 101-113 (ISSN: 1029-3981) 5782, 97.03. 52. Chin-Hsing Chen, S. Y. Tan, and Wen-Tzeng Huang, (2007) . A novel hardware-software co-design for automatic white balance. International Journal of Mathematical Models and Methods in Applied Sciences, Issue 4, Vol. 1, pp. 223-231. 53. Wen-Tzeng Huang, S. Y. Tan, Chin-Hsing Chen, L. K. Lee, (2007) . Design and Implementation of a DVB-H IP-Decapsulator. International Journal of computers, Issue 4, Vol. 1, pp. 189-195. 54. Chin-Hsing Chen, Chun-Ta Chen, and Wen-Tzeng Huang, (2007). Grey Decision-Aware Flash Management System for Mobile Devices. The Journal of Grey System, Vol. 19, No. 3, pp. 209-220. 56. 陳錦杏, 游麗惠, (2007) . 醫院資訊系統評估模式之建構. 健康事業科技與新管理評論二００七年九月號, Vol. 2, No.2, pp. 13-34. 57. 陳錦杏, 黃少美, 陳政男, (2007) . 放射線醫師接受結構性報告相關因素探討.中華放射線技術學雜誌, Vol. 31, No.2 pp. 173-184. 58. 黃文增, 陳錦杏, 蔡政翰, 譚巽言, (2007). 高品質和快速彩色影像內插演算法之設計. 台北科技大學學報, Vol. 40-2, pp. 101-113 (ISSN: 1029-3981) 7251, 96.09. 59. 陳錦杏, 譚巽言, 黃文增, 徐三勝, “自動白平衡之軟硬體共同設計”, 台北科技大學學報, Vol. 40-1, pp. 101-113, March,2007 (ISSN: 1029-3981) 6310, 96.09. 61. 譚巽言, 徐三勝, 黃文增, 陳錦杏, (2006) . 一個新的適用於可強奪式固定優先權即時嵌入式系統的動態電壓調整演算法. 台北科技大學學報, Vol. 39-2, pp. 9-22 (ISSN: 1029-3981) 7773, 95.09. 62. 黃文增，陳彥勝，陳俊達，陳錦杏， (2005) . 反及閘快閃記憶體壓縮頁配置策略之探討. 台北科技大學學報, Vol. 38-2, pp.13-22. 63. 黃文增, 陳泰全, 余信緯, 張維良, 周慶棟, 陳錦杏, (2004) . 藍芽架構的全方位看護機制. 台北科技大學學報, Vol. 37-1, pp. 91-104. 64. 黃文增, 楊秀美, 陳錦杏, 周慶棟, (2004) . 各種長度的迴圈嵌入到損壞有向性超方體之研究. 台北科技大學學報, Vol. 37-1, pp. 125-136. 65. 陳錦杏, 李琮堯, 尹磊君, (2004) . 建構一個數位學習平台之研究. 中臺學報,第十六期, pp. 149-184. 66. 鄭重志，黃文增，陳俊達，陳錦杏, 2003. 快閃記憶體檔案管理系統的設計與實作. 台北科技大學學報, Vol. 36-2, pp. 43-62. 67. 鄭重志,黃文增，陳俊達，陳錦杏, 2003. 嵌入式計算系統保護器-Case Study.台北科技大學學報, Vol. 36-2, pp. 31-42. 68. 黃文增，楊國偉，林用，陳錦杏, 2002. 可漸進延伸之有向性超方體. 台北科技大學學報, Vol. 35-1, pp. 187—209. 1. Chun-Hsu Yao, Chin-Hsing Chen, Yuan-Jen Chang*, “Development of polymer gel dosimetry and optical-CT for radiation therapy in Taiwan,” The Fifth International Symposium on Radiation Education (ICRE2016), P-2,pp.7, 16-19 Dec. 2016, Koriyama, Fukushima, Japan. 2. Chun-Hsu Yao, Tung-Hao Chang, Min-Jia Tsai, Yuan-Chun Lai, Chin-Hsing Chen, Yuan-Jen Chang*, “A study on clinic brachytherapy using 3D polymer gel dosimeter,” The Fifth International Symposium on Radiation Education (ICRE2016), O-3,pp.7, 16-19 Dec. 2016, Koriyama, Fukushima, Japan. 5. 陳錦杏, 張淵仁, 彭彥凱, 陳昱翔, 李勇潮, 鍾博翔, 楊志強, 黃冠傑, 張開喜, “植物工廠水耕蔬菜光照度調控以手機搭配IOT物聯網之研究,” IETAC 2016第九屆資訊教育與科技應用研討會, pp.141-143, 25 March, 2015. 台中. 中臺科技大學資訊管理系等編著. 9. 張淵仁 , 陳錦杏 , 鄭逸君, “運用O2O創新經營模式於水耕植物工廠購買意願之研究”, (IETAC 2015) 資訊教育與科技應用研討會論文集, pp.137-142, 27 March, 2015. 台中. 修平科技大學資訊管理系等編著. 10. 張淵仁， 陳錦杏， 施佳緯，黃鵬峻，林昌隆，李建宏，吳偉瑄，殷奕韋,“整合物聯網與APP於植物工廠遠距即時影像與環境監測,” (IETAC 2015) 資訊教育與科技應用研討會論文集, pp.342-347, 27 March, 2015. 台中. 修平科技大學資訊管理系等編著. 11. Ling-Ling Heieh; Chin-Hsing Chen; Bor-Tsung Hsieh; Yen-Chih Lin; Jay Wu, Yuan-Jen Chang* ,” Implementation of an automation system for manufacturing 3D polymer gel dosimeters,” Abstract of the 9th International Topical Meeting on Industrial Radiation and Radioisotope Measurement Applications (IRRMA-9), Valencia, Spain, 6-11 July 2014, Published by Martin Impresores, Editor Jose Rodenas, ISBN: 978-84-942137-5-5. 12. Yuan-Jen Chang* ; Chin-Hsing Chen; Bor-Tsung Hsieh; De-Shiou Chen; Yuk-Wah Tsang,” Study on 3D NIPAM Gel Dosimeter for Five-Field IMRT Dose Verification,” Abstract of the 9th International Topical Meeting on Industrial Radiation and Radioisotope Measurement Applications (IRRMA-9), Valencia, Spain, 6-11 July 2014, Published by Martin Impresores, Editor Jose Rodenas, ISBN: 978-84-942137-5-5. 13. Yuan-Jen Chang, Chun-Hsu Yao, Jay Wu, Bor-Tsung Hsieh, Yuk-Wah Tsang, Chin-Hsing Chen*, “Quantitative evaluation of image registration method used for NIPAM gel dosimeter,” 2014 Symposium on Radiation Measurements and Applications (SORMA XV), Ann Arbor, MI, USA, June 9-13, 2014. 17. YJ Chang, JQ Lin, BT Hsieh, CH Chen,” Dose evaluation of NIPAM polymer gel dosimeter using gamma index,” 1st International Conference on Dosimetry and its Applications (ICDA), pp.93,June 23-28, 2013, Prague, Czech Republic. 18. 張淵仁*, 彭志元, 陳錦杏, 黃文增, “以雲端運算系統為基礎之三維影像資料庫之研究與開發,” 2013展場導覽與雲端科技Apps學術研討會, May 15, 台南, 2013. 20. Yuan-Jen Chang, Jing-Quan Lin, Bor-Tsung Hsieh,Chin-Hsing Chen, “Dose evaluation of NIPAM polymer gel dosimeter using gamma index, 1st International Conference on Dosimetry and its Applications, June 2013. 21. 陳錦杏、張淵仁、黃緯珣、黃文增、尹磊君,” 利用互動平台分析社群網絡關係結構提升醫病信任度之研究”, 第六屆資訊教育與科技應用研討會, March 2013. 22. 陳錦杏、張淵仁、黃宗偉、陳家維、吳威融、羅永祥、林晉毅, “中臺科技大學行動生活導覽系統APP 開發”, 第六屆資訊教育與科技應用研討會, March 2013. 23. 張淵仁、陳錦杏、曾淑婷、黃群鈞、陳孟哲、林思廷、黃怡晴、李雅喬、陳玲慈, “影像辨識行動點名系統”, 第六屆資訊教育與科技應用研討會, March 2013. 24. 陳錦杏、尹磊君、許鈞萍、劉良毅, “醫院員工數位學習接受度初探－以中部某區域教學醫院為例”, 第六屆資訊教育與科技應用研討會, March 2013. 25. 陳錦杏,蘇文凱,陳侑宗,張安利,吳修良,” 自創品牌與上網購買意願之探討-以精緻蛋糕為例”, 2012第8屆全國商學研討會,Sep. 2012. 26. 陳錦杏, 蘇文凱, 盧文啟 (2012), 客製化建構人力資源資訊系統與績效評估之關聯性, 2012資訊科技國際研討會暨第二屆網路智能與應用研討會, April27-28, 2012. 27. 陳錦杏, 黃緯珣, 黃文增, 尹磊君, 張淵仁* (2012), 應用Kinect 體感技術於中風復健遊戲系統之建置, 2012資訊科技國際研討會暨第二屆網路智能與應用研討會, April27-28, 2012. 28. 張淵仁, 許炳銓, 陳錦杏* (2012), 以體感感測器提升遠距復健動作評估之研究, 2012資訊科技國際研討會暨第二屆網路智能與應用研討會, April27-28, 2012. 29. 曾宏立, 陳錦杏, 王星堡, 譚巽言, 黃文增* (2012), 30-FPS CCD 高畫質攝影機設計, 2012資訊科技國際研討會暨第二屆網路智能與應用研討會, April27-28, 2012. 30. 陳錦杏, 白峻榮, 林沛萱, 鄭彥哲, 洪聖惠, 陳郁臻, 張紘銘, 張淵仁* (2012), 以iPhone 智慧型手機建構居家緊急救護系統, 2012資訊教育與科技應用研討會, March 23, 2012. 31. 張淵仁, 白峻榮, 劉孝純, 張益銘, 許希緁, 鄭仲伸, 陳工誼, 洪偉軒, 李育滄, 陳錦杏* (2012), 結合智慧型手機的自行車玩家行動救護系統, 2012資訊教育與科技應用研討會, March 23, 2012. 32. 陳錦杏, 段裘慶, 譚巽言, 吳明宗, 呂冠鋐, 黃文增* (2012), 智慧型非同步影音串流擷取機制應用於行動裝置, 2012資訊教育與科技應用研討會, March 23, 2012. 33. 張淵仁、段裘慶、陳錦杏、呂冠鋐、黃文增*, 以串流技術開發應用於凝膠劑量劑之三維影像雲端運算平台之研究, 2012 資訊教育與科技應用研討會 (2012-IETAC), March 2012, pp. C3-1-C3-5. 34. 黃文增, 李紀萍, 繩守廷, 陳錦杏, 情境感知遠距監控與定位救援手仗之設計, 2012智慧電子應用設計研討會, Feb. 2012. 35. Yuan-Jen Chang, Chin-Hsing Chen, Wen-Tzeng Huang, Li-Feng Lin and Chen-Yi Lee, (2011). Implementation and performance evaluation of a real-time tele-monitoring system based on a private cloud platform, American Public Health Association(APHA) 139TH Annual Meeting and Exposition OCT 29 - NOV 2, 2011 Washington, DC. 36. Yuan-Jen Chang, Chin-Hsing Chen, Wen-Tzeng Huang, You-Yin Chen, Kwan-Hwa Lin, (2011). A study on game-based instruction for telerehabilitation, The Ninth Asia/Oceania Regional Congress of Gerontology and Geriatrics 23-27 October 2011 Melbourne Australia, (GERO 2011). 38. Wen-Tzeng Huang, Chin-Hsing Chen, Tan-Hsu Tan, Yuan-Jen Chang, Kwan-Hwa Lin, Jian-Cheng Dai, (2011). A Guardian with the Fatigue-Index Reminder over IEEE 802.15.4, International Conf. on KNOWLEDGE BASED INDUSTRY-2011 (ICKI-2011), July 2011, Ulaanbaatar, Mongolia. 39. Chin-Hsing Chen, Wen-Tzeng Huang, Yuan-Jen Chang, Kwan-Hwa Lin, Hung-Li Tseng, You-Yin Chen, (2011), Awaring Overweight and A Tele-Fitness Bike International Conf. on KNOWLEDGE BASED INDUSTRY-2011 (ICKI-2011), July 2011, Ulaanbaatar, Mongolia. 40. 陳錦杏, 謝佩瀚 (2011), 台灣醫療用血資源耗用分析之研究, 2011年健康產業管理學術研討會及玉山醫務暨健康管理學會學術研討會暨會員大會, May, 2011. 41. 陳錦杏, 林育伶 (2011), 遠距照護服務系統於社區之評估研究, 2011年健康產業管理學術研討會及玉山醫務暨健康管理學會學術研討會暨會員大會, May, 2011. 42. 陳錦杏, 蔡玲真, 陳冬蓮, 呂彥陞, 金榮義 (2011), 台灣醫療用血資源耗用分析之研究, 2011年健康產業管理學術研討會及玉山醫務暨健康管理學會學術研討會暨會員大會, May, 2011. 43. 陳錦杏, 黃文增, 吳漢斌, 張淵仁, 戴建誠, (2011), 塑身健身車之虛擬教練設計, 第四屆資訊教育與科技應用研討會, pp. A44-A49, March, 2011. 44. 黃文增, 黃博原, 陳錦杏, 張淵仁, 曾宏立 (2011), 基於XMOS嵌入式系統平台之漸進式模組教學法之實作與研究, 第四屆資訊教育與科技應用研討會, pp. A61-A66, March, 2011. 45. 黃文增, 段裘慶, 游筱婷, 陳錦杏, 張淵仁, (2011). 精巧型遠距非穩定步態與生醫訊號分析設計,第四屆資訊教育與科技應用研討會, pp. C114-C119, March, 2011. 46. 戴建誠, 劉宗翰, 曾宏立, 陳錦杏, 黃文增, (2011). 架構於電動跑步機之虛擬塑身教練設計實作, 第四屆資訊教育與科技應用研討會, pp. C94-C101, March, 2011. 52. 黃文增，段裘慶，劉彥廷，陳錦杏，張淵仁， “精巧型無線即時步態分析系統之研究”, 2010第五屆智慧生活科技研討會 (ILT 2010)，p545(6), June 4, 2010. (ISBN: 978-957-21-7647-4). (2/3) NSC 98-2218-E-002-010-and (2/3) NSC 98-2622-E-159-003-CC3. 53. 黃文增，段裘慶，游筱婷，賴建宏，張淵仁，“基於高效能XMOS平台之紅外線溫度儀研究”，2010第五屆智慧生活科技研討會 (ILT 2010)，p296(6), June 4, 2010. (ISBN: 978-957-21-7647-4). (2/3) NSC 98-2218-E-002-010-and (2/3) NSC 98-2622-E-159-003-CC3. 56. KH Lin, JS Lai, JJ Luh, SC Chen, WT Huang, CH Chen, YJ Chang, YY Chen, SM Yu. Telerehabilitation in subjects with subacute stroke. 2nd Asia-Oceanian Conference of Physical and Rehabilitation Medicine in Taipei, Taiwan, pp.28, April 29-May2, 2010. 64. W. T. Huang, C. N. Hong, C. C. Tuan, C. C. Chen, Y. J. Chang, and Y. Y. Chen, “Novel Design of Interactive Caption and Recognition Postures within the Wearable and Non-Vision System over Wireless Sensor Network”, The 4th International Workshop on Intelligent, Mobile and Internet Services in Ubiquitous Computing (IMIS 2010), Accepted, Feb., 2010. 69. 黃文增,陳右穎,陳錦杏,張淵仁,林光華,李景堯,具無線可穿戴式多生醫感測器之中風患者守護神研究, pp. 229-232, Dec. 2009國際生物力學研討會暨台灣生物力學年度學術研討會. 73. Wen-Tzeng Huang. Jing-Ting Lin, Chin-Hsing Chen, Yuan-Jen Chang, and You-Yin Chen, “Accurate Analysis of IEEE 802.15.4 Slotted CSMA/CA over a Real-Time Wireless Sensor Network”, The first international conference on Sensor Systems and Software (S-Cube), Sept., 2009. 74. 黃文增,郭裕欣,譚旦旭,陳右穎,陳錦杏,張淵仁,“具定位救援保暖衣系統之發展”,第四屆智慧生活科技研討會, pp. 528-534, June, 2009. 75. 張淵仁,黃文增,林笠農,陳右穎,陳錦杏,“緊急醫療之輔助系統設計與實作”,第四屆智慧生活科技研討會,pp. 521-527, June, 2009. 77. 黃文增, 陳右穎, 張淵仁, 陳錦杏, 林幸男, 許君竹, 2008. 高可靠度的無線感測平台之實作與研究”, 2008 RFID 科技論文研討會. 82. 陳錦杏, 金榮義, 尹磊君, 詹琪文, 林瑞雯, 顏培煒, Nov., 2008 . 照護流程標準化-以急救流程數位學習為例. 2008 資訊教育與科技應用研討會, 2nd IETAC, pp. 65-70. 83. 李琮堯, 陳錦杏, 陳哲明, 謝嘉樺, 陳建志, 吳家榛, 楊釉筑, Nov., 2008. 以UCCT 模型分析Web 2.0 於補教業創新應用服務. 2008 資訊教育與科技應用研討會, 2nd IETAC, pp. 197-202. 84. 張淵仁, 陳右穎, 黃文增, 陳錦杏, 陳建中, 郭致遠, Sep., 2007. Research of wireless sensor network applied on leisure industry. 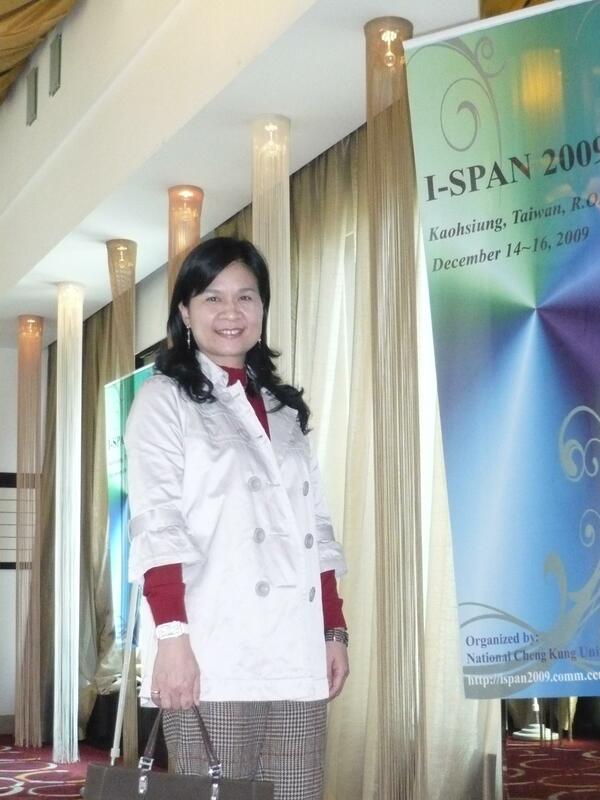 2007 International Symposium of Recreation Therapy and Sports-leisure Industry. 85. 黃文增, 陳右穎, 張淵仁, 陳錦杏, 陳奕安, 林俊良, Nov. 2007. 使用瀏覽器當管理介面的嵌入式無線感測網路閘道器設計與實作. 第二屆電資科技應用與發展. 86. 黃文增, 古士興, 陳錦杏, 周慶棟, Nov., 2007. 基於差分對IBIS 模型的同步切換雜訊抑制與設計. 第二屆電資科技應用與發展. 87. 黃文增, 呂啟豪, 陳李泉, 陳錦杏, Nov., 2007. 基於差動對之預防串音干擾的精巧型設計. 第二屆電資科技應用與發展. 88. 黃文增, 楊國偉,陳錦杏,譚巽言, Nov., 2007. 扇型結構的開路截線應用到印刷電路板的共振感知設計. 2007 年全國電信研討會. 89. 柯美如, 黃欣怡, 莊淳芬, 陳嘉欣, 林香伶, 陳錦杏, 李琮堯, Nov., 2007. 具可擴散性的華文數位教材資訊之研發. 2007 資訊教育與科技應用研討會. 90. 黃文增, 周慶棟, 古士興, 陳錦杏, May, 2007. 基於加強型IBIS 模型的同步切換雜訊之感測及防制設計. (2007 Conference on Microelectronics Technology and Applications) 2007 第五屆微電子技術發展與應用研討會, pp-155-156. 91. 陳錦杏, 任沛淳, 簡淑真, 蔡玲真, March, 2007. 護理人員使用無線射頻識別器之影響因素探討. 第二屆國際健康資訊管理研討會. 96. W. T. Huang, C. T. Chen, C. H. Chen, and Y. S. Chen, (2005) . A Compression Layer for NAND Type Flash Memory Systems. ICITA'2005, pp599-604. 97. W. T. Huang, C. T. Chen, C. H. Chen, and R. S. Hsiao, Dec. 2005. JFFS2 檔案管理系統可靠度之探討. ICIS 2005,中華民國九十四年全國計算機會議，p24 (6pages). 98. W. T. Huang, C. T. Chen, C. C. Cheng, and C. H. Chen, 2003 . An Embedded 8051 System Protector. 2003ICICS, pp. 1089-1094. 99. W. T. Huang, C. T. Chen, C. C. Cheng, and C. H. Chen, 2003 . Minimizing the Transmission Rate of RF-27M JS. 2003ICICS, pp. 1935-1940. 100. 陳錦杏，黃文增，陳俊達，鄭重志, 2003 . 快速-低價快閃記憶體的IP實作. 2003 年民生電子研討會, pp. 130(6 pages). 101. 陳錦杏, 黃文增, 陳俊達, 廖威霖, 2003. Embedded Computing System Protector-Case Study. 2003 數位生活與網際網路科技研討會, pp106 (1-9). 102. 陳錦杏,黃文增, 鄭重志, 廖威霖, 2003. Minimizing the Transmission Rate of RF-27MWireless Mouse. 2003 數位生活與網際網路科技研討會，P29 (1-8). 103. W. T. Huang, W. K. Chen, and C. H. Chen, 2002 . On the Fault-Tolerant Pancyclicity of Crossed Cubes. Proceeding of the Ninth Inter. Conf. on Parallel and Distributed System ICPADS2002, pp. 484-488. 104. W. T. Huang, W. K. Chen, and C. H. Chen, 2002 . Pancyclicity of Mobius Cubes. Proceeding of the Ninth International Conference on Parallel and Distributed System ICPADS2002, pp. 591-596.